If necessity is the mother of invention, then innovation is its nurturing father. The word innovate comes from the Latin to “make new.” The need for innovation has never been more pressing—in society as well as in organizations. The T50 Innovation Award recognizes the thinker who has contributed the most to our understanding of innovation in every sphere over the last two years. Previous winners include Navi Radjou and Clay Christensen. The entire Collective Genius team is honored to receive this recognition, which has only been awarded three times. Who is the most influential living management thinker? The Thinkers50 2015 global ranking provides the answer. Published every two years, it is the essential guide to which business thinkers and ideas are in – and which have been consigned to business history. The 2015 Thinkers50 ranking was unveiled tonight at the “Oscars of Management Thinking” awards at Drapers’ Hall in the City of London. Announcing the first Leading For Innovation (L4i) Lab will be held in Turin, Italy from December 1 – 3. Based on over a decade of work and research with exceptional leaders of innovation, we’ve created an immersive and powerful experience that shatters assumptions about what it takes to build teams that innovate through collaboration — not just once, but repeatedly. Inside the L4i_Lab, every participant will grapple with the theory and practice of leading creative teams to innovate through collaboration. It is an opportunity to experience a completely new way of working within a team. Participants will understand how to better mobilize their teams toward creating something “new and useful” and better fulfill their ambitions for organizations and stakeholders. You will take with you new leadership skills that will deliver immediate benefits to your team and organization. Visit the program’s website to learn more about this unique experience. 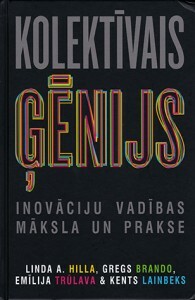 We, the authors of Collective Genius, want to give you an update on our book which has now been out for a year. We could not have written the book without the generosity of the leaders and teams at our many research sites, who graciously shared their time, insights, and stories. We thank them again and again. What they had to say resonates deeply with people across the globe! The Axiom Business Book Awards are the largest and most respected critical guidepost for business books in today’s new world of publishing. These prestigious and competitive awards are presented in 21 business categories and serve as the premier list to help readers discover new and innovative works. 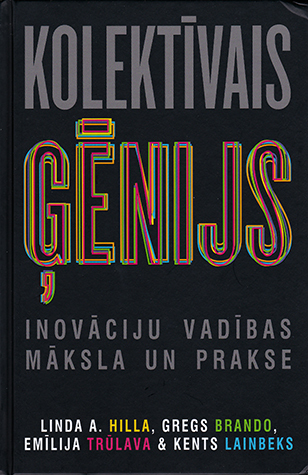 Collective Genius has been awarded the gold medal in the “Leadership” category of the 2104 Axiom Business Book Awards. Warren Bennis, who died last summer, was one of the world’s most influential thinkers on the topic of leadership. To honor Bennis’s legacy, Harvard Business Review and the USC Marshall School of Business, where Warren taught for three decades, jointly established the Warren Bennis Prize, which recognizes the best article on leadership each year in HBR. Our HBR article outlining Collective Genius’s key arguments was published in the June 2014 issue and won the first ever Warren Bennis Prize this year. Linda gave a TEDx talk about Collective Genius and it has had 1,200,000 views in just a few months since it went live on the TED website. 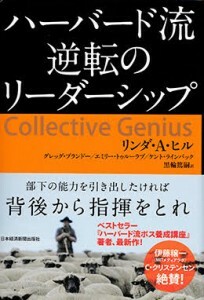 Collective Genius has been translated into 4 languages with more to come, and has had 3 reprints. Thank you so much for your interest in learning these important lessons about leadership for innovation. 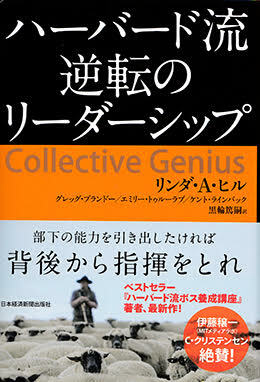 PS: Here are two fun images from the international editions: Collective Genius in Latvian and in Japanese! Who knew that authors’ names get translated too? See Linda’s May 19, 2015 interview with L’Opinion here. “This past spring Greg Brandeau M.B.A. ’92, former chief technology officer at The Walt Disney Studios and the coauthor of a new book from Harvard Business Review Press called Collective Genius, returned to campus to talk to students at the Fuqua School of Business about leadership that has the power to transform companies. He calls it the “collective genius.” Read more of this Summer 2015 Duke University Magazine article here. On April 7, Jessica Chou at Refinery29 published an article “The Assertive Girl’s Guide To Getting What You Want” which features Linda talking about Collective Genius. We encourage you to read this piece. And, on another note, Linda’s TED talk has amassed over 1 million views (1,042,364 as of this writing). The Telegraph interviewed Linda back in February, in a piece titled “You need fights to get innovation in the workplace.” Check out this 1:26 minute video when you have a moment. In an interview with Scientific American Mind contributing editor Gareth Cook, Linda describes how certain key principles, such as embracing debate, open-minded leadership and active experimentation, can allow creative organizations to thrive. Read more of this piece at Scientific American (log in required). Back in Feburary, Daniel Bortz from Money magazine quotes Linda Hill and mentions Being the Boss in an article for Time Magazine.